Why SWTOR failed? That's easy: SWTOR is too much of a WoW Clone. But the players don't have their WoW background on it. 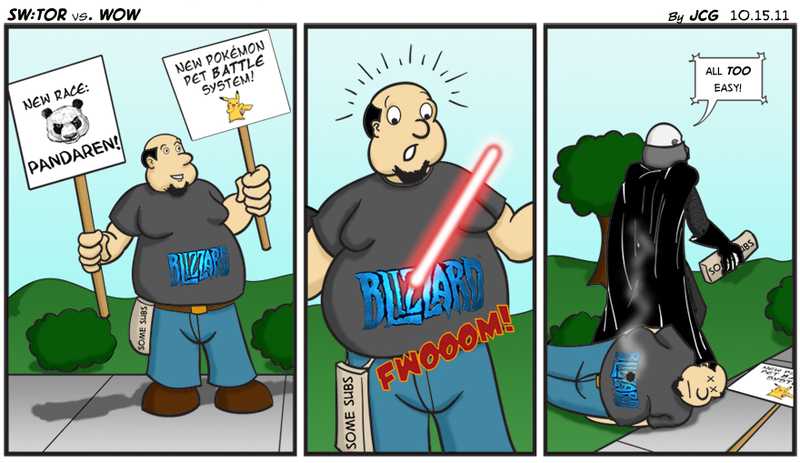 Even if you liked SWTOR (like I did), after 2/3 months you were doing the same things that you did on WoW. But why would you keep playing SWTOR ? Your friends are on WoW. Your guild is on WoW. Your main with 200 days of /played is on WoW. Your rerolls are on WoW. Your achievements are on WoW. And... WoW still had a better quality and better features. Bioware just created a mix between Kotor and WoW. But things are not so simple. Players wanted a new gameplay, awesome features that would be great with SWTOR... But they failed at it. Space travelling is a useless process, space fights are ridiculous, the planets ... THE PLANETS are just as big as regions in other MMOs. Bioware didn't want to create a revolution in the world of MMOs, they wanted to create a WoW with dialogs in SW universe. And the worse is... SWTOR became an awful F2P. Probably one of the worst F2P games. If you don't pay, you almost can't play. While some game have very few limitations (Rift, Tera NA), SWTOR chose to became unplayable without paying for it.